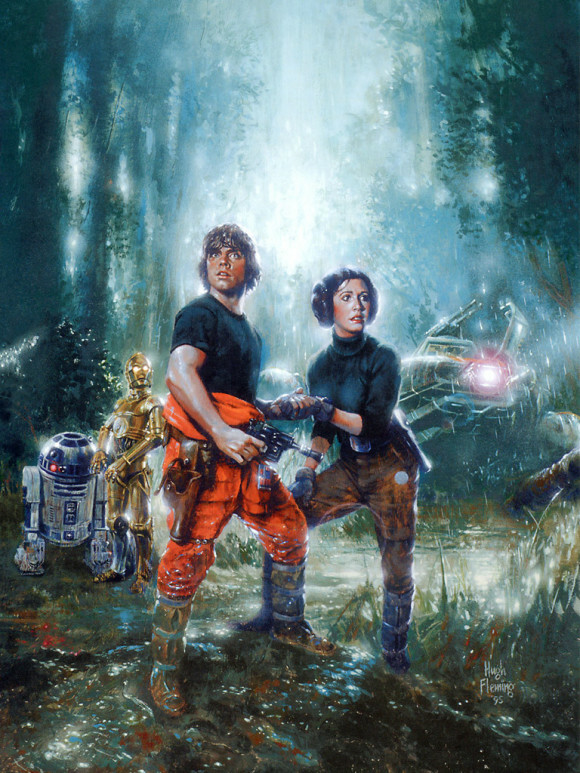 being the first original full-length Star Wars novel to be published after the release of the 1977 Star Wars film, retroactively making it one of the earliest Expanded Universe works. Hence why I wanted to read it! How could I pass up the book that started it all? It was even commissioned to be a low-budget sequel in case the first film flopped! Yet, being first has its pro's and con's. It is a great read, and laid the groundwork for many other great stories. The LA Times considers it one of the most essential Expanded Universe works to read, and I found the story to be quite advanced for the first fan fiction work. 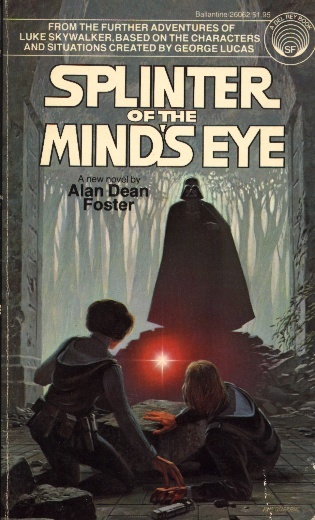 And the book certainly takes advantage of the imagination, creating worlds and creatures that I'm sure would stretch the limits of the current special effect of the time, but are no problem for the "mind's eye" (pun intended). And the electric ball of energy Vader shoots at Luke that Luke must deflect? I think that may have inspired a few scenes in the films! However, it does suffer from coming before the other movies, as many of the characters seem...lacking, in light of future events in the film canon. Like the fact that Vader can be shot by Leia. Sure he doesn't really get hurt, but when we see him totally capture a blast from Han Solo in Empire Strikes Back, it seems a little unlikely he would have been so off guard. The love relationship between Luke and Leia is certainly played up, but that's in line with what happens in the next film, so nothing too shocking there. Also, Luke is too good with his lightsaber in this novel! I will give him the ability to be experimenting with the Force and all, but his last battle with Vader didn't seem quite realistic. And that he is able to cut Vader's arm off (with no mention of its electronic/robotic nature by the way) in the novel, and yet he fares much worse in the next film, seems a stretch. And it takes away so much from the moment in Return of the Jedi when Luke cuts of Vader's arm and is faced with the realization of his likeness to his father. "That's one of the things that's so wrong with the Empire, Luke,” she commented enthusiastically. “Its art has grown as decadent as the government. Both suffer from a lack of creative vitality. That’s what originally drew me to the Alliance, not politics. Politically, I was probably almost as naïve as you...When I was living in my father's palace, I was utterly bored, Luke. Examination of why I found nothing entertaining led me to discover how the Empire had stifled any original thought. Long-established totalitarian governments fear any kind of expression. A sculpture can be a manifesto, a manuscripted adventure can double as a cry for rebellion. From corrupt aesthetics to corrupt politics was a smaller step than most people around me realized." That is why fan fiction is so awesome! Sure it may be a bit heavy-handed, but that's a serious issue, one that we see on our own world. And when we are able to connect our galaxy to theirs is when the galaxy becomes not so "far away." It becomes a lens to see our own lives through, one where our heroes are fighting the same fights we fight here. We are able to connect, relate, and learn. The Empire becomes more nuanced, is given more depth, and becomes an all too real villain.